No one spoke. They didn't have to. They had been there. Sunlight flashed on cinnamon spiral. A purple-gray bull passed through an opening in the mopane trees and stood one hundred yards down a narrow lane with branches and thorn bush between. The bull looked back and his horns disappeared into the tree behind him. We found the spoor beneath the tree. By the look of it, the bullet had entered low and too far back. There was blood on the ground. We followed faint impressions in the sand. Suli worked out the trail for close to two hundred yards. Then he froze. The line of the kudu’s back and a curve of horn were visible above the brush. By the time my rifle was up, he was gone. In the foothills above the Limpopo, we hunted an orange grove where kudu cost the farmer a good deal of his crop. Up in the hills above the orange groves, mica sparkled like tiny diamonds in the sun. The big antelope’s robe had been flecked with the mineral. A branch had fouled my shot. Or I had blown it. Suli led the way, sorting the tracks of our bull from those of other bulls and kudu cows. 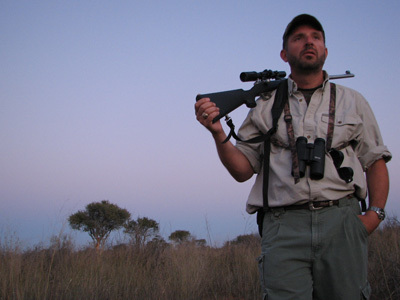 Wighardt van der Gryp, our professional hunter, was next in line. We were followed by Lyn and Brian and two other trackers. Suli watched the crooked course of the trail and, bent over at the waist, the trees ahead. “Kudu,” he whispered. The bull drifted like smoke ahead of us. No opening. I drilled a bullet toward him, but it didn’t make it. Brian handed his big Winchester up to me. I handed my Featherweight Model 70 to him. Suli led on. Now the track turned back toward where we started. Right behind him now. “Here,” Suli said and pointed. The bull was in an opening, quartering, now straight away, toward thicker cover ahead. There must have been a three-position safety, a trigger to caress. All I remember was the bull with his head up, two bounds from cover and the crosshair on his neck. The 300-grain Partition knocked the bull off his feet. I chambered another round, but we didn’t need it. Now, at camp, Wighardt lifted his glass in silent tribute. At the edge of the light, the trackers sat on their haunches and smoked their last cigarettes of the day. Bright points of orange fire blazed against the dark. Spirals of smoke lifted out of the dying embers of the fire and faded against the stars like a big bull vanishes in the mopane.